I think this long(ish) run may rank up there with one of my worst runs EVER (although the Tower of Terror 10 Miler still officially holds that honor, this was a VERY close 2nd). When I left at 7am the humidity was at 98% and by the time I was done (it was supposed to be 10 miles but I cut it short) it felt like 90+ degrees, I was out of water and I thought there was a good chance I was going to pass out (there was a lot of walking involved in this “run”). Any wild turkey experts out there have any better suggestions??! I still feel like I am so behind on where I wanted to be as far as Marine Corp training. I had really hoped to be getting some speed work in and wanted to be farther a long on my long runs, but I am enjoying my time at the Cape and doing what I can to get my runs in so I can’t complain! Hoping to get 3 runs and 3 days of yoga on the beach in this week! 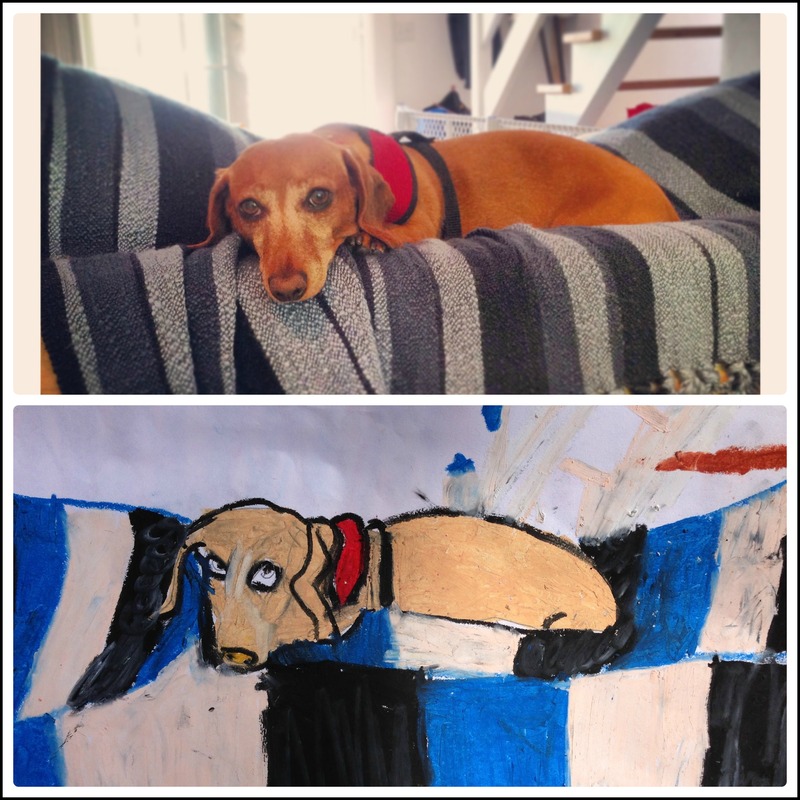 My 9 year old cousin drew this portrait of Madison on her favorite chair! UGH…I am hating running in this weather, really. I’m glad at least one of us was intelligent enough to know when it was time to head back! Glad you made it home okay. Also…I’d be totally terrified if I saw one of those turkeys! The worst I ever see are deer and the occasional chipmunk, haha. Ugh! I lived in Boston for 12 years and those things are territorial and vicious! They chased my mom back into the house one morning too. I have no idea how to deal with them, but maybe just book it the other way to get off their turf? See, that is why I am so freaked out! After I googled it I read/ saw that they really do attack and chase people! I laughed about the wild turkey comment! I am visiting my Mom in Needham, MA and they have tons of wild turkeys here and I can’t stand them. When I have Lulu here I get nervous they might attack her! 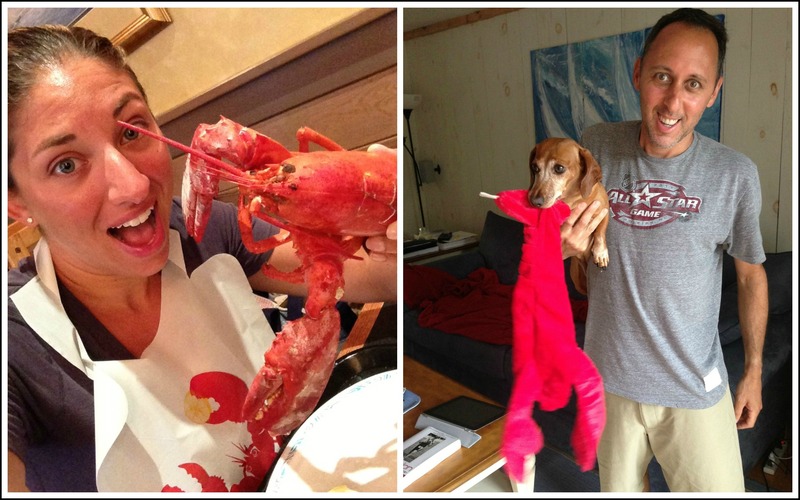 Loved the lobster photo and thank goodness I am going for a lobster roll for lunch in just a few minute! Otherwise, I would be jealous! I was thinking the same thing about Madison – that it’s a good thing we don’t let her out here not on a leash because these things are crazy! Hope you enjoyed your lobster roll! Super cute drawing! I did an 8-miler on Sunday at it absolutely DESTROYED me. The heat/humidity in the Northeast is a spirit killer. Hang in there. Your training we get better when it dies down. Don’t know much about wild turkeys but I can vouch for Canada geese being angry, angry birds. 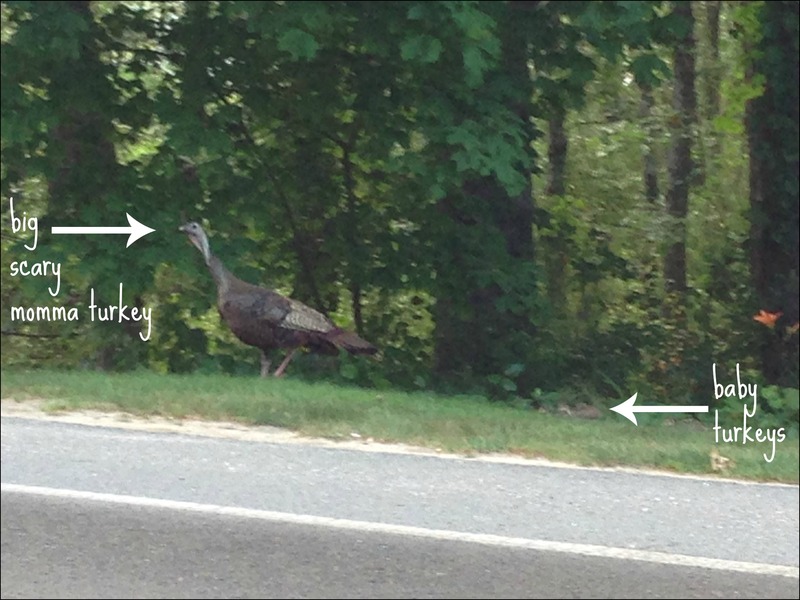 If turkeys are anything like them, give them a WIDE berth when you pass by them! Honestly you described it so perfectly…a “spirit killer” – that is exactly how I felt, the entire time I was like, “Great, I have a half marathon in a month and a full marathon in 3 months…how on earth am I supposed to do that if I can’t even complete a 10 mile run!” I can not wait until this humidity goes away! TOT was seriously brutal. I agree, but I was also wearing a cape that stuck to my back the whole time, so that might not have helped. I’m refusing to read anymore of your recaps until you get back to the city! Quick making those of us stuck and miserable in the city jealous. haha! Ugh…I can not even imagine having a cape stuck to me during ToT! There is a pack of wild turkeys that live near me, but I haven’t had any problems with them. Maybe carry pepper spray just in case? And running in high humidity in warm weather is the pits! One or other, but not both 😦 good luck on your training! I’m sure the turkey will spare you since you don’t eat them! I’m always an advocate of pepper spray for things like this…good luck with your wild animal situation!! LMAO! That’s hysterical! Well the yelling at the turkey part. I have NO idea how you even managed 9 miles on Monday! That’s freaking awesome, even with the walking. And talk about far behind on training? I finally calendared my Dumbo (and W&D plan) and have followed, oh, about none of it so far. But I know you’ll do great! 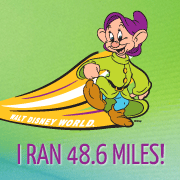 I haven’t been doing the best job of sticking to a training plan either…I’m honestly not so worried about Dumbo, but I’m getting really nervous about not being ready for Marine Corp in October! Haha, I’m glad you thought it was funny (now hopefully I won’t ever have to try it!) And isn’t the picture of Madison great! I can’t wait to get it framed!